When MUM is running, an icon will appear in the notification area of the taskbar. This icon has a number under a coloured bar. This number usually displays how much of your download allowance you have left (as a percentage). However if the plan has no download limit, then the number will be the day of the month. The colour of the bar indicates whether your current downloading rate is within budget (see below). Once MUM has been installed and configured, most of the immediately useful broadband information will be displayed on MUM's Broadband page. Firstly, it is important to note that the displayed usage can be an hour or two behind actual usage. This is because the usage data supplied by Internode's server may be about ½ hour behind actual usage and MUM only gets this data once an hour. Your Internode account billing cycle can start on just about any day within the calendar month, not just on the first day of the month. The day that your account changes from one billing month to the next is displayed towards the bottom of MUM's Broadband page. 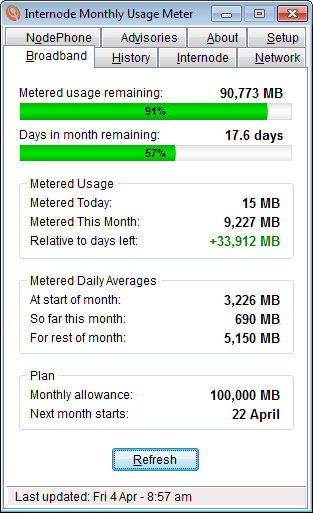 The 'Daily Averages' box can help you plan and adjust your downloading habits to suit your chosen plan. MUM's main window can be minimised to the Windows taskbar or tray at any time by pressing the <ESCAPE> key. The help key <F1> will popup this webpage so you can easily review the information here. 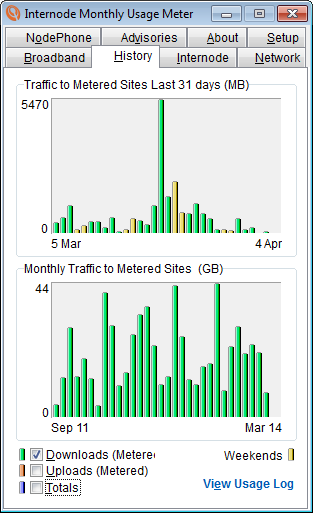 The History page shows previous download activity in two charts. The top chart displays metered download usage for the last 30 days. The bottom chart displays metered download usage in monthly totals based on billing monthly cycles (ie not calandar months). By moving the mouse pointer over a specific day (or month), the metered downloads recorded for that day (or month) will be displayed in a hint window. A log of your broadband history can be viewed by clicking the 'View Usage Log' button. The Internet IP is the address that other internet sites see as your PC's address (ie the PC that's running MUM). If you aren't running MUM from your Internode broadband connection then this address won't be the same as the address of your broadband account. If your PC has more than one network adaptor, make sure you choose the adaptor that connects your PC to the internet. The trackbar sliders on the right of the chart can be used to change the scale of the bars for network traffic coming in and out of the PC through the selected network adaptor. 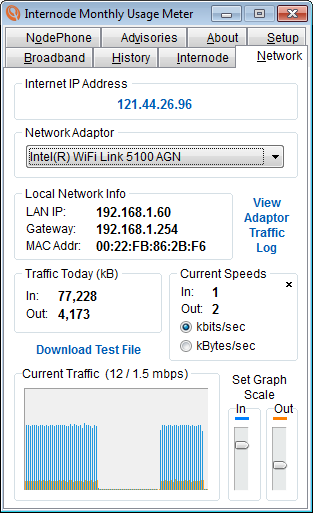 The blue bars in the chart indicate the speed of traffic coming into the PC (downloading) while the orange bars indicate the speed of traffic going out of the PC (uploading). Note regarding internet download speeds: Don't expect your downloads from the internet to occur at the nominal maximum of your internet plan speed. Internet data frequently comes from sites that are sending data to many users simultaneously and hence can't send data as quickly as you can receive it. Also, traffic congestion somewhere between you and the source is very common and also slows downloads. MUM also stores a log of each adaptor's daily traffic. This text file can be viewed by clicking the 'View LAN Log' button. Setup is divided into 5 separate pages. The 'General' page is the only one that must be configured before you can access all your account information. Enter your username and password. The username does not require the '@internode.on.net' extention (or '@adsl' for business accounts) but it is important that the correct account type is selected. Whenever MUM connects to Internode's servers, all usernames and passwords (ie for ADSL, Email & NodePhone accounts) will be transmitted securely (ie encrypted), so there's no risk of these being intercepted by third parties. Note: If you're a newcomer to Internode it can take a day or two for Internode's webserver to learn of your presence and display meaningful information. Therefore, don't be surprised if, for a couple of days, you can't get your usage or the displayed rollover date is incorrect or whatever. 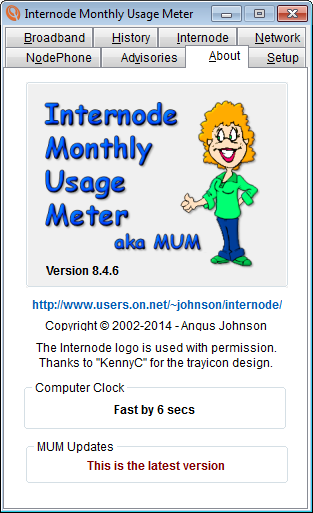 You can (optionally) enter your Internode Client ID which will then be visible on MUM's 'Internode' page just below the Internode logo. It is useful to have easy access to the Client ID when accessing extra information from Internode's website or when getting telephone technical or account support from Internode. Selecting 'Automatically Check for MUM updates' will allow MUM to automatically check for new versions once a day (or whenever MUM is restarted). If an update is available, MUM's icon in the notification area of the taskbar will flash an alert. When MUM is set to 'Run on startup', it is often necessary for her to delay getting the first update while the computer establishes a network connection. The 'Startup delay' field can be changed to either shorten or lengthen this delay (in seconds). The 'Proxy' page settings can safely be ignored unless MUM is installed in an office environment. 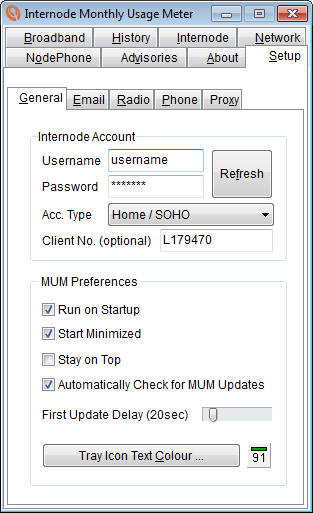 In MUM's Email Setup page, MUM can be configured to check for new mail in Internode email accounts. 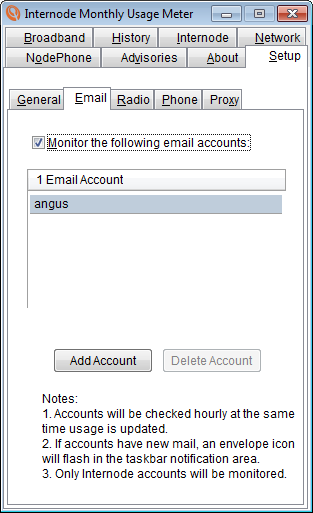 First make sure the 'Monitor email accounts' checkbox is ticked then add email account names and passwords in the labelled fields. Then, once an hour when MUM updates usage, she'll also check the nominated email accounts for new emails. If new messages are found, an envelope icon will flash in the notification area of the taskbar. Click the envelope to stop it flashing. Also, this mail checking feature isn't intended to replace a mail client. It is designed as an easy way to notify you of new mail if you only check for mail infrequently or at times when you've forgotten to run your mail client. With the introduction of NodePhone2 it's possible to receive voicemails (from missed incoming calls) via email. MUM will detect voicemail email messages and flash a telephone icon alert in the notification area of the taskbar. Just click the icon to stop it flashing. Internode 'relays' well over 50 online streaming radio channels. Downloading from these relayed channels is 'unmetered' so will not be counted in your monthly downloads. Provided you've installed an MP3 music player on your computer, MUM offers an easy way to listen to these channels. 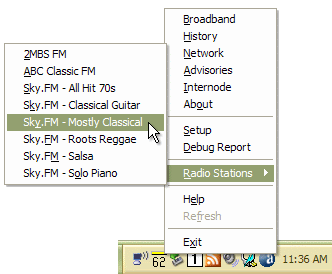 To listen to a radio channel, right-click MUM's icon in the notification area of the taskbar (ie near the PC's clock) to popup the menu which contains the radio channel list. 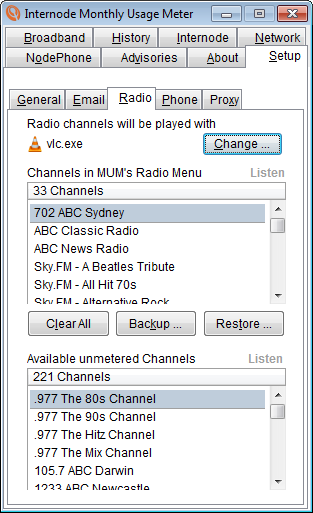 The selection of channels that Internode relays is updated from time to time so the Available Radio Channels list is updated daily. However, since the full list contains many channels, it is impractical to include all channels in the popup menu list. Therefore include in your selected channels only those stations you're likely to listen to (up to about 20 channels). You can easily add and remove channels from your selected list at any time. Note: Some 'unmetered' stations may not included in the default list because their content may include explicit or offensive language. If you have a NodePhone VoIP account with Internode, MUM can also keep track of your NodePhone usage once you've entered your NodePhone number and password in the Phone section on MUM's Setup page. 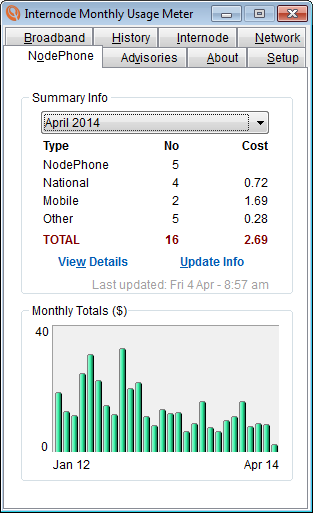 Monthly summaries of your phone calls are displayed, broken into different call types. This info is only updated once a day, either at the first usage update after midnight or when MUM restarts. If you need an up-to-the-minute summary, then click the 'Update' button on MUM's NodePhone page. A full listing of every NodePhone call made for the selected month can also be viewed by clicking the 'View Details' button. By installing this software the user acknowledges that he or she is receiving this software on an "as is" basis and the user is not relying on the accuracy or functionality of the software for any purpose. The user further acknowledges that any use of this software will be at the user's own risk and the copyright owner accepts no responsibility whatsoever arising from the use or application of the software. Linux with WINE installed and Intel based Mac with CrossOver or VMware Fusion installed. nb: If you wish to install this latest version of MUM over a previous version, the previous version does not need to be uninstalled. However, make sure MUM is not running when installing this newer version. Thanks to "KennyC" who designed the notification area icon. The Internode logo has been used with permission. Bugfix: Fixed broken email checking. 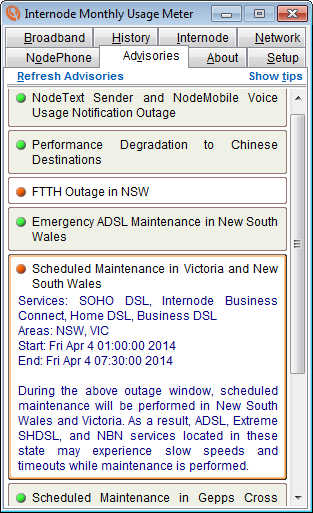 Bugfix: Several links to Internode's website (eg Webmail) were broken. Q: What ports does MUM use? Q: What does "Socket Error XXXXX" mean? A: Socket errors occur when MUM can't reach the Internode server. This is almost always due to a firewall blocking MUM (especially common after a recent MUM update). Solution: Ask someone who knows how to configure your firewall to get it to allow MUM to talk to the internet again. Q: Can I get MUM to update usage info more frequently than hourly? A: No. There's little point because the data at Internode's end isn't updated more frequently than that so you'd just get the same data as last time. Q: The radio menu is too big. Can I have two columns of radio menus, or station sub-categories or whatever? A: No. But you can delete those stations you don't listen to via the Setup - Radio page. Q: Can MUM monitor my non-Internode email accounts too? Q: Is MUM reliable? 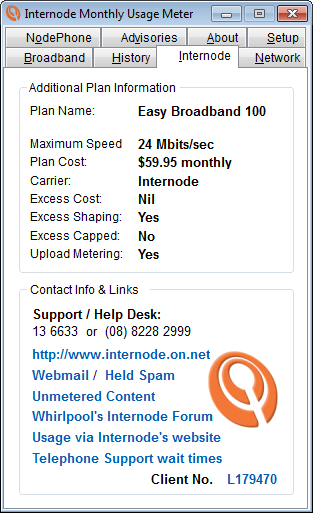 The data displayed on MUM's Broadband page appears to be different to what I see on the Internode Accounts webpage. A: MUM gets all broadband usage data directly from Internode. 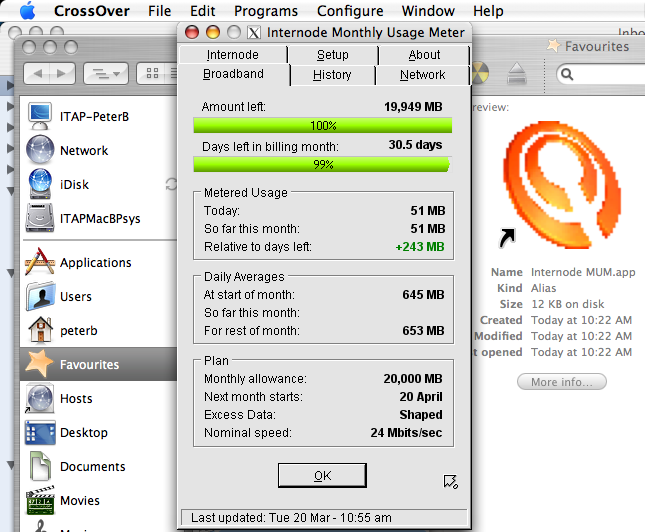 If you want to see the raw data that MUM is getting from Internode then click here. Q: I have auto-check for application updates selected but MUM's website has a more recent version. Is the auto-check broken? A: No. The auto-check is often a little behind the website because most users don't want to be pestered with numerous minor changes. However, significant changes, once they've been well tested, will be announced via MUM's auto-update feature. Q: I'm running MUM in WINE on Linux. Can I assign a music player so the radio menu will work? 1. Setup your principal account as described above. 2. Create a shortcut to MUM.exe for each additional account. Change the commandline string of the shortcut (via its Properties) to include the username and password. It would also make sense to rename each shortcut with the user's name. DAD is a separate application to MUM and has been designed for users who want to monitor a number of Internode accounts in the one window. The information presented in DAD is very similar to that displayed on MUM's Usage page. Most of the information displayed is self explanatory. 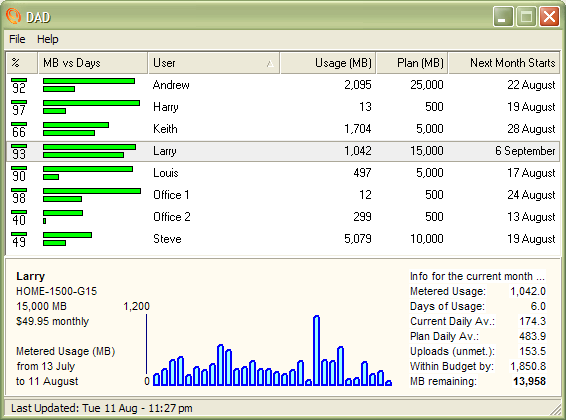 However, the coloured bars in the second column need some explanation: the top bar represents your remaining download allowance as a percentage of your total monthly allowance; and the bottom bar represents the days remaining in your billing month as a percentage of the number of days in that month. Column four displays download usage so far for the billing month.